Uptown Saint John is celebrating Earth Day by hosting our 5th Annual Uptown Clean Sweep! 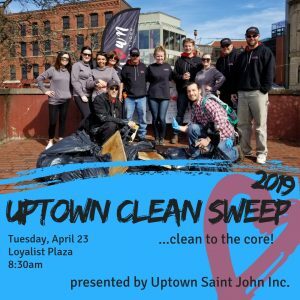 Individuals and Corporate Teams will be gathering in Loyalist Plaza at 8:30am, then scattering throughout uptown streets to pick up the litter that the winter season has left behind. This is an event that creates community pride and team building, all while sprucing up our urban neighborhood! If you would like to join us as an individual or team, with an interest in uptown, please contact 633.9797. ← Uptown Burger Week – 6th Annual!